At Sacred Heart Kindergarten we believe that learning can happen spontaneously only through fun. Indian parents tend to home tutor the children and add to the pressure on them. The textbook less policy, metted out by the school provides absolutely no content to the parents to pressurize the child still have wholesome learning in school. This policy enables our children to step out of the confines of the books and learn more creatively through a huge range of activities. It is only when we involve children in conceptual activities will we get meaningful learning. That is exactly what happens at Sacred Heart Kindergarten! Developing the IQ (Intelligence Quotient), EQ (Emotional Quotient) and DQ (Digital Quotient) is equally important in today’s world. Smart classrooms and tab based learning enable students to learn in the most tech savvy way. Sports like basketball in association with NBA National Basketball Association of America and football in association with LaLiga, rhythmic gymnastics and skipping, help our students remain active and fit. The fortnightly menu ensures a homemade, balanced diet to all our students. Our students will grow up to be better human beings with better connect to their parents. 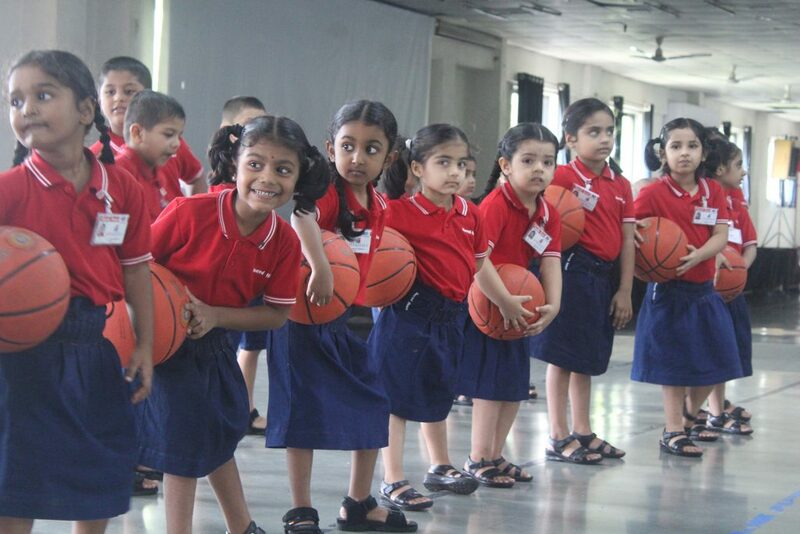 In a time when children are confined to screens and only 3% play more than 6 hours a week, we at Sacred Heart Kindergarten boast of active students who eat better, play better and perform better in all arenas of growth and development. 0% home tutoring for Sacred Heart Kindergarten students, yet fantastic learning in school, is a proof that activity based learning has everlasting effects on teaching learning process and child centered education is imparted seamlessly without any pressure on the children. For the children to create a positive attitude toward our community helpers and learn the importance that they contribute to the community. For the children to know how the community helpers actually help us in our daily lives through role playing. Children learn different types of traffic rules and traffic signals, toll plaza and pedestrian/ zebra crossing decorum. By learning the traffic signals (Red - Stop; Yellow - Slow; Green - Go, No U-Turn, Left Turn, Right Turn, etc), the children came to know when to move, slow down and stop their vehicles. They also learn when and where to cross the street. Hence, they developed positive attitude towards road safety which can help them in their daily lives. For the children to learn that world is divided into 7 Continents (Asia, Africa, North & South America, Antarctica, Europe and Australia). For them to learn that the biggest continent is Asia and India is a part of it; and the smallest continent is Australia. They learn about the animals name, their young ones, their shelters and their sounds by wearing the animals masks and mimicking the sound they create and moving towards their respective shelters. For the children to learn the different names of the flowers and their description (i.e. Lotus is the national flower of India), texture and colours. 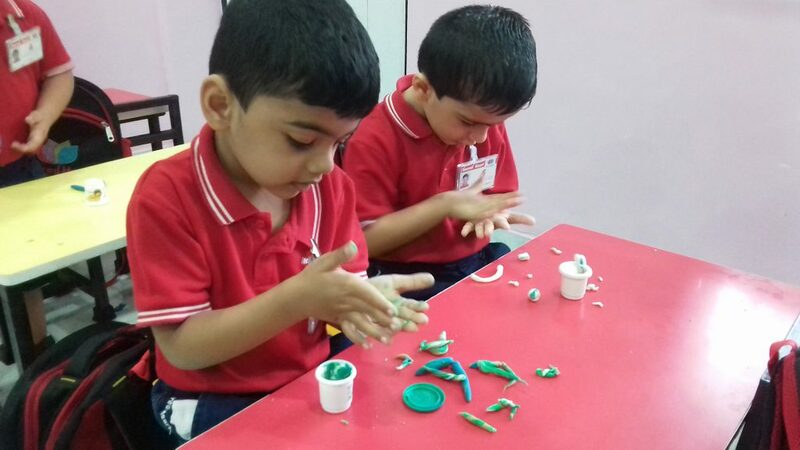 Through hands-on active learning, they do not only remember the names of the flowers but they enjoy while learning it. The children learn basic colours red, green, blue, yellow, black, brown while singing the Colour Song with actions and recognising which coloured T-shirts are the teachers wearing. Each child will spin the Alphabets Wheel and then they would go for a treasure hunt to find the corresponding pictures according to whichever letter that the arrow stops on. For the children to understand the meaning of more and less in a fun and active way. Each would have to run towards a table with two transparent bowls marked with M for more and L for less. Through which they would put more beads on the M marked bowl and lesser beads on the L marked bowl. For the children to gain knowledge about the meaning of Agriculture and how it is important for our daily lives. They will have a hands-on learning on how to plant seeds, take care of them by watering them and ensuring they get proper sunlight, and then finally harvesting them.